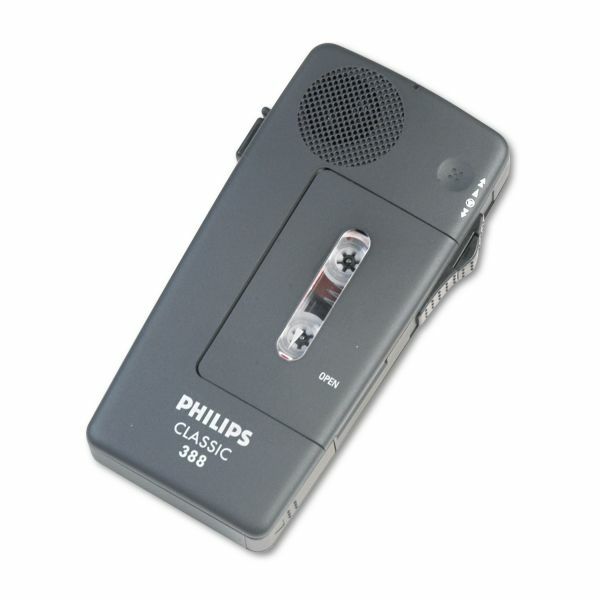 Philips Pocket Memo 388 Slide Switch Mini Cassette Dictation Recorder - The integrated recharging device in the Pocket Memo 388 keeps you working without interruption, enabling rechargeable batteries to be replenished during use. The four-position switch makes one-handed operation a snap. Offers voice-activated recording for hands-free dictation, fast access to any part of the tape with Turbo Wind. Monitor fast forward and rewind with Audible Scan. Fast Erase enables swift deletion of confidential recordings. Transport Lock avoids unintentional operation. Audible end-of-tape warning avoids dictation loss. Record protection saves valuable dictation. Adjust playback/recording volume with volume control. Automatic Gain Control adjusts to optimum recording level. Includes 30-minute Mini Cassette 005, two AA batteries and wrist strap.